You’re getting married and your head is bursting with ideas about the perfect venue, the guest list, a budget and a hundred other concerns. You’ve been thinking about it all because you’ve downloaded our free Party Planning Checklist and realize the scope of planning this important life milestone. Making a decision about whether your reception will be a formal or an informal affair, or for that matter, your son’s bar mitzvah or your parent’s 50th anniversary, needs to be part of your vision, before you think about the 5 steps to successful party planning: budget; date, time & location; food and beverages; guest list and invitations; and entertainment. Three weddings I attended in the past few years really put this into perspective for me. How critical the choice of deciding if it’s better for you and your guests to feel good at a wedding & reception that fits your style, than for every thing to look perfect, like the pictures you’ve seen on TV, in bridal magazines or online. 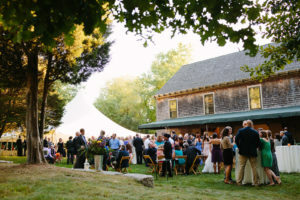 One of these receptions was held in the yard of the bride’s parent’s home, one in a rustic barn on the grounds of a former farm, and one at a traditional wedding venue. The first two couples clearly wanted their receptions to “feel good” for them and their guests. They opted for unique venues, food, and music that fit their personal styles rather than more formal receptions at traditional venues. The feel of these receptions seem more important to them than the look of the party. One bride and groom held the reception in the yard at her parents house. A tent provided shade if desired as well as tables and comfortable chairs. We enjoyed a signature cocktail and a bountiful hors d’oeuvre buffet, the couple wed, then a pizza truck arrived! The music came from the groom’s collection of favorite tunes and was not intrusive though lively enough for those who wanted to dance even though there was no dance floor. Some of us lingered for hours while others did not, but it felt right. When the cappuccino cart arrived later in the evening, I was happy I stayed! 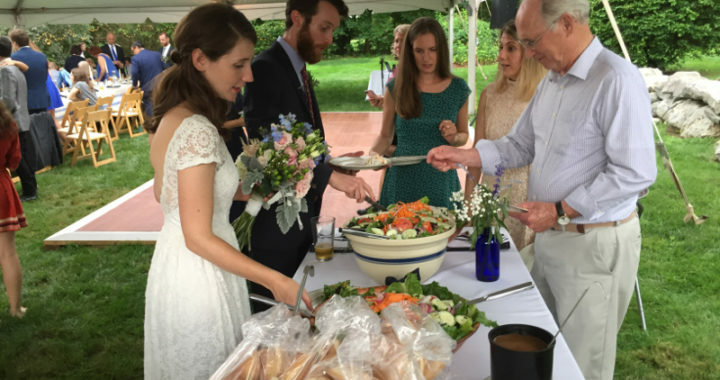 The informality, from the ceremony, to the food to the music fit the couple and made it fun for them & their guests – from her 85 year old grandparents to the 8 year olds. Wedding two, at a rustic barn, was also an informal affair. We sat on hay bales while the couple wed, then entered the barn for a delicious buffet of cold & hot items as well as desserts which were replenished for hours to accommodate all appetites. Both high-tops and traditional tables were set up in the barn along with comfy couches. The music & dancing was inside the barn to a DJ who set up at the opposite end from the food. The couple thoughtfully also placed tables and comfortable, padded chairs outside for those who wanted more quiet conversation. Since they realized an October evening could be chilly, they had heaters outside the barn and a basket of fleece blankets! It felt so natural and just right for this couple. The third wedding was very traditional starting with a formal ceremony at the venue. Stations and passed hors d’oeuvres followed for an hour in a room that was cramped for the number of guests and had a few high tops but no seating. Dinner was served in a beautifully decorated, formal banquet room, where most of the guests remained seated for about an hour and a half while everyone was served. This was followed by 2 hours of dancing to a very loud 8 piece band. There was no quiet place for those who found the music too loud or wanted to talk with family members and other friends. A gorgeous, well-planned formal affair but one that seemed planned more to look good than to feel good for the couple and their guests. 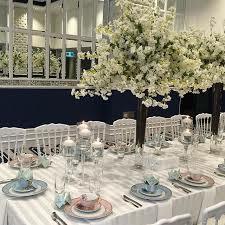 Before you think about a budget, guest lists, venues, music and food, think about your vision for your wedding reception and decide if it will be formal or informal. Plan the perfect wedding and reception for YOU and your intended – the one that feels good. You’ll be glad you did. If you haven’t received our free Party Planning Checklist, just sign up to receive The Gersky Gazette & you’ll be sent a link to download it. And don’t forget that Gersky’s is here to help you plan the perfect event from a wedding reception at your home to helping you celebrate in a unique venue with the perfect menu! Posted in Bar/Bat Mitzvah, By Location, By Occasion, Entertaining Tips, Family events, Home, Uncategorized, Venue, Wedding, Where to Begin.